Health Codes: What are the Laws? Over the past 25 years, more people are wearing sandals, flip-flops, and open-toe shoes. Because of their popularity, flip-flop wearing patrons are no longer hassled. These are now considered “shoes,” and businesses no longer hassle patrons. There is too much money at stake. We have written to all 50 States and will have all of our letters posted as they come back. You will notice in the letters that Health Departments ONLY focus on food sanitation, safety, & storage – of FOOD. The Health Dept. does NOT focus on “health codes” at banks, comic book stores, call centers, or offices. ONLY food. The Health Dept. does NOT govern CUSTOMERS. Every USA State agrees that a customer ordering food – or even eating at a table – is not a health risk for food preparation. Customers do not spend time preparing food or handling anything in the food preparation area. For employees, it does get a bit different. Each state has a rule for employees who are handling food. 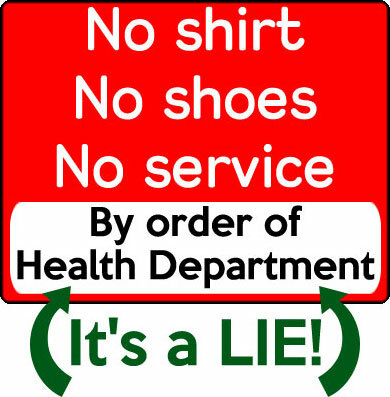 Although each state advises that they do look for “clean clothing,” shoes are rarely mentioned. If shoes ARE mentioned, it is for employees who handle grease or are working with hazardous materials. Even so, when a state does mention shoes, it is very vague and does not mandate what type of shoes. 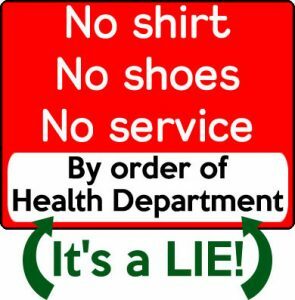 With the Health Dept.s sharing this info, we have learned that hostesses, waitresses, baristas, smoothie makers, and bartenders are ALLOWED to go barefoot. The BIL may not endorse it fully in some cases – but it is in fact LEGAL. Also, here are the Health Department letters we have received back from Health Depts.